Merry Christmas to Frosty and his twin. 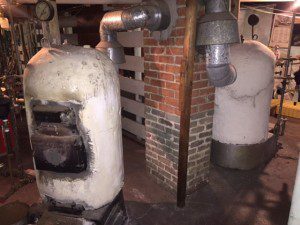 Old asbestos-covered boilers are nicknamed “Snowmen” here in New England. These boilers were installed in local houses until the early 1960s. Many have been around so long that they used to burn coal and were later adapted to burn oil or gas. Over the years, I see fewer and fewer of them. They were well-made cast-iron boilers, so many owners kept them running and running and running. The EPA has a lot to say about residential asbestos. There are many companies that remove asbestos from your home. If there is any chance that the asbestos can get airborne, it is important that you take care of it. A professional removal company will use plastic sheeting to trap asbestos that comes free during the process. If there is a small amount of asbestos (like on a few feet of pipes in the basement), they can use a plastic bag to wrap it, then remove it. Most of the time, removal will require creating a plastic-sheeted room around the asbestos boiler or floor. Then a fan is used to collect the asbestos-polluted air and filter it. The removal of asbestos is not as expensive as many people think. Generally, it costs between $1500-3000. A big part of that cost is disposal of this asbestos so that no one is harmed by it. If you bought a house with Frosty and his twin, you would want to replace both of these boilers not only because of asbestos, but also because they are not efficient and fuel costs are high. Your bill for that work will be about $3000 higher than if you are removing two boilers that are inefficient and don’t have asbestos components. Snowmen must be buried as befitting their status, as noble toxic waste. They did their job well and deserve the respect due them. Boilers made later do not last nearly as long.